The C&D UPS12-745MRF Valve Regulated Lead Acid (VRLA) Battery Series is designed for UPS Standby Power Applications. 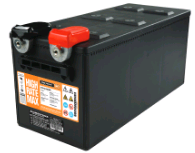 C&D Technologies’ addition to the High Rate Max front access line provides a 12V 4D battery that meets the needs of today’s higher power UPS systems as an ideal fit for new system installs and 4D battery retrofits. Self Discharge/Storage time from a fully charged condition: 6 months at +77°F (+25°C). For each +15°F (+9°C) rise, reduce the storage time by half.